Ever thought that donning a snowboard in board shorts and sunglasses enjoying balmy temperatures was impossible? Think again! Snowboards might be built for snow, but it’s not the only surface in which this multifaceted sporting device excels. That’s right, for years now, people have been using snowboards to hit the slopes of the sand dunes of Cape Town! Amazingly, with just a few alterations to the surface of the underside of any snowboard, you can glide imperiously across the sand dunes of Cape Town, enjoying the beautiful scenery, and the incredible weather, with absolutely no white out in sight! Sandboarding has been a big deal in some parts of the world for years, and is remarkably close to the sport of snowboarding that so many of us know and love. Snowboard boots and bindings are used in exactly the same way they are in the snow, with the boards benefitting from a super slick treatment which gives them the necessary glide required over the harsh and more gripping tendencies of sand over snow. Of course, there’s a slightly different feel to the sport, but if anything, you feel even more connected to the ground through your board. Cape Town is the perfect location for this incredible experience. Just forty minutes away from the city is the beautiful Atlantis nature reserve, home to some incredible white and far reaching dunes, offering long smooth rides, giving you plenty of space to glide and carve to your heart’s content. As you might imagine, the space afforded to you is incredible, and a far cry from the packed slopes of the Alps you might have experienced while snowboarding in Europe. This is a land where the horizon is not dotted with people careening in different directions, in fact all you are likely to see on the horizon are the incredible visage of Table Mountain and the city of Cape Town spreading out below you. Of course, at times, sandboarding is a little less forgiving than snowboarding, notably when you catch an edge! If you’re halfway down a dune, then the chances are the sand is going to be pretty soft and forgiving, but here and there, and especially at the end of runs, the sand can be quite firm and the falls can be verging on painful, but of course when you compare that to smacking straight into a tree, then it’s child’s play! As far as we’re concerned, sandboarding doesn’t quite live up to its chilly cousin, which is for the most part down to the fact that there’s no great network of lifts and runs. That being said, Cape Town is a great place to visit, and the addition of being able to sandboard in the near vicinity is a massive bonus! It’s a similar euphoric feeling, it doesn’t cost a fortune, and let’s face it, everyone loves the idea of being on a snowboard in the warmth! If you’re going to try sandboarding anywhere, then Cape Town has to be the place. It’s a beautiful city which has a culture with a great fondness for extreme sports. That sounds good enough to us! 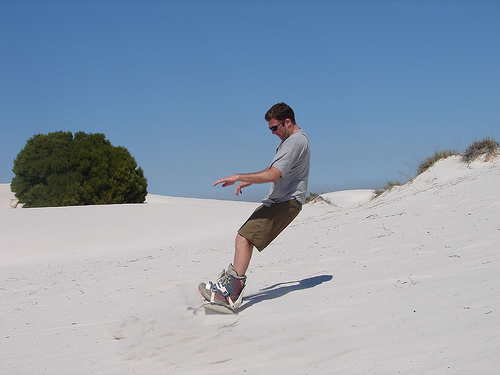 This entry was posted in Africa, Bizarre, Sand Boarding, Travel and tagged Cape Town, Sandboard, Sandboarding, South Africa. Bookmark the permalink.